I’m actually not that impressed with this movie. 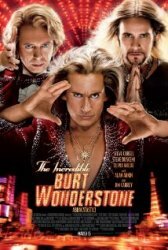 When you think of Steve Carell and Jim Carrey (stars of this film) you think of all-out humor, but this movie is lacking in laughs. I feel like they put most of the funny parts of the film into the trailer and left nothing for the movie. I had such high expectations for this film and they were let down. Don’t get me wrong, the movie is entertaining and has a few hilarious moments, but it isn’t what I expected from a film with so much hype. There is nothing special about the cinematography, it is a quality picture, just like any other 2D film you would see in a theater today. However, I do like the use of colors when it comes to costume and set design by Dayna Pink and Andrea Fenton because they show the more cheesy side of Las Vegas entertainment. My favorite scene is the very end of the film when Burt and Anton pull their biggest stunt. It’s so funny when you see the “behind the scenes” work that goes into their trick because it seems so ridiculous and over-the-top-funny. My favorite character is Rance Holloway played by Alan Arkin because he is such a witty character. Rance is the old magician who inspired Burt to become a magician and when Burt meets Rance later in life, it is very comical. Not only are their interactions funny, but also touching. Burt had lost touch with the wonder and amazement that magic brings and Rance is able to re-teach Burt a few old tricks that help him rediscover why he first became a magician. This entry was posted on Monday, March 25th, 2013 at 11:12 am and is filed under Jury Updates. You can follow any responses to this entry through the RSS 2.0 feed. Both comments and pings are currently closed.